Want to make some cute, Halloween themed candles? These would be very cute just sitting around to spruce the spooky feel! All you need to start with is some plain white votives. I got mine by the case at Big Lots. I bought a pack of 24 votive sized candles at the local Big Lots for around $6.00. 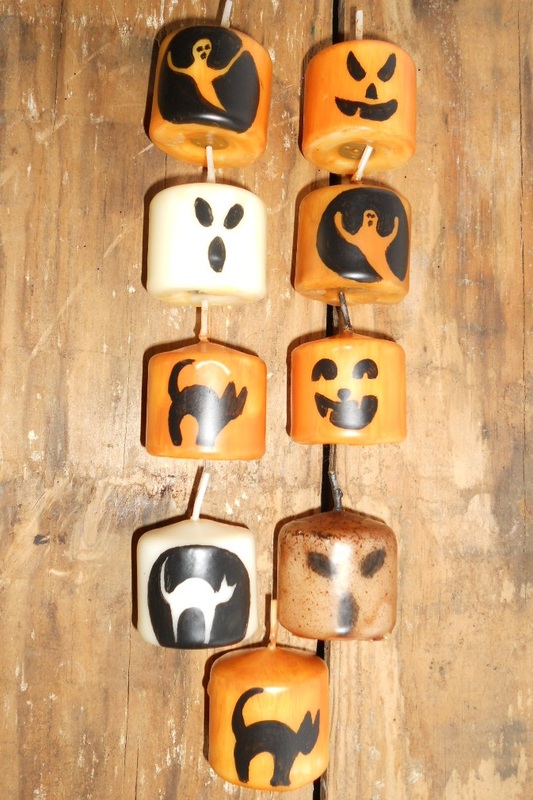 These orange themed ones stemmed from my previous post, Ghost Candles. Once I got started making ghost faces on the white ones, I just had so many other ideas for them. Pumpkin faces, cat silhouettes, ghosts in a moon, the list goes on and on so I had to make more. Then I painted some of them a base color of orange. I chose cinnamon color but it came out way more bright than I thought, which was okay. Left some white also, for the ghosts faces. Next I google'd "pumpkin faces" and choose images, so I'd have an idea of what some looked like to draw. Painted them on with basic black craft paint. And then, here's where I got a little different with them. Instead of simply sealing them with a paint on sealer, I thought it'd be cool to set the faces in wax. So I dipped each candle down in it, kinda quick, so that the paint wouldn't melt away from the hot wax. Then set them on a sheet of wax paper to dry. And that's it. Oh, if you have noticed the grubby candle with the eyes, I simply grubbied it up a bit with some melted wax and cinnamon. Dipped that in the wax to set. Then continued on with painting the face and re-dipping him. And then after they all dried, which they kinda quickly do, here is how I package them up. I put them down in a small plastic bag and add a piece of cut brown paper. (Sometimes I cut up the brown wrapping paper or brown bags for this.) And then use those printable re-turn address labels for a price tag. And here is a little box crate of them all ready to go into my booth for sale. Don't forget to check out my Ghost Candles for more pics! 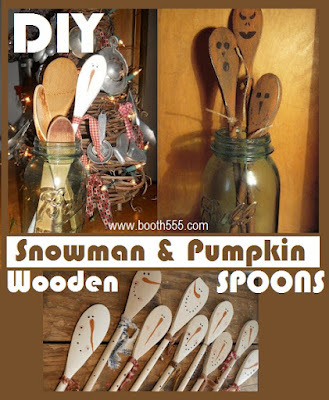 And if you're interested, I made some Halloween Themed Wooden Spoons to display in Mason Jars also found here! Neat idea, thanks! New follower from Gather. Check out my blog and follow back if you care to.